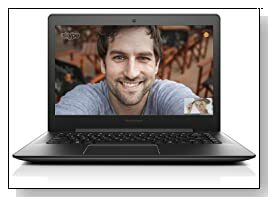 Lenovo S41 (80JU000VUS) is a 14 inch laptop with the 5th generation Intel i7 processor with a Passmark benchmark score of around 4000 that delivers energy efficiency as well as power (many modern Haswell i7 processors have Passmark score of 7-8000 and more) but this is still really good for every day use and more complex tasks as 8000 benchmark would be an overkill for most people and combined with an 8GB memory you won’t really experience any delays no matter what you do. There is also the dual core Intel i5-5200U at 2.2GHz (80JU000UUS) model with 8GB memory and 1TB memory + 8GB SSD (same amounts as the i7 model). Both models are great for those that require power and speed and is suitable for just about anyone- for work, school or home entertainment purposes. The Lenovo S41 we’re reviewing on this page includes the dual core Intel i7-5500U Broadwell processor at 2.4 GHz speed which moves up to 3.0GHz with Intel Turbo Boost feature and hyper threading for two cores to run four threads in parallel, a generous 8 GB DDR3L SDRAM for being able to run several programs, a hybrid hard drive of 1 TB 5400 rpm Serial ATA hard drive at 5400rpm rotating speed plus and 8 GB Solid-State Drive to help the system boot up faster (and not for overall performance boost- you need larger SSD for that) and Windows 8.1 operating system that you can swap with Windows 10 free of charge immediately after turning the machine on for the first time. It is actually the 5th generation processor that helps this machine to be so very thin (only 0.76 inch). 14 inch non-touch full HD display with a maximum screen resolution of 1920 x 1080 pixels and 16:9 widescreen cinematic aspect ratio offers crisp and bright images and integrated Intel HD 5500 graphics is good enough for some level of gaming (this is not an advanced gaming PC and is not priced as one) which is older titles at highest settings fluently and current titles at lower. 14 inch display is a little smaller than the regular 15.6 inch but the FHD 1080p resolution shows itself even more so on this smaller display and you have the advantage of better portability. You’ll get to hear quite all right sound ‘immersive surround sound’ through the dual stereo speakers and headphones with the Dolby Home Theater without distortion at maximum volume output and with great clarity and there is a basic 720p webcam for problem-free online video chats. 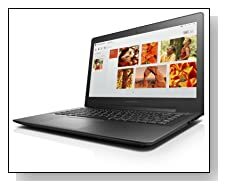 Slim and lightweight black Lenovo S41 weighs 3.7 pounds with measurements of 13.39 x 9.45 x 0.77 inches, feels durable and looks premium with all metal chassis. It has an ergonomic design backlit AccuType keyboard without 10 key numeric pad (numpad feels like a little in the way for me- I personally prefer them without) and touchpad that supports multiple gestures- scrolling, rotating, zooming and more. 3-cell 45Wh lithium ion battery will give you up to 5 hours of battery life on a single charge. There is no optical drive because of mainly size restrictions and to make up for other things but you can get one to 20-30 dollars easily on Amazon. Connectivity options include the 802.11 A/C fast wireless with wider coverage, Bluetooth 4.0 if you wish to use a Bluetooth enabled mouse, 2 x USB 3.0 ports for transferring data between your laptop and other units with up to ten times faster speeds than USB 2.0 but is also backward compatible with USB 2.0 technology, 1 x USB 2.0 port, 1000Mbps Ethernet with RJ-45 connector, an HDMI output to hook up to your large screen HDTV and SD/MMC card slot. Conclusion: Although Lenovo S41 is in a compact package- designed for portability and on-the-go use, it is rather rich in features, power and performance so you can work and play better with its brand new powerful fifth generation i7 processor and 8GB memory for much better multitasking without lagging or freezing. Optical drive has the somewhat slower 5400rpm spindle speed (7200rpm or SSD would be better as the 8GB SSD will mainly be good for starting up fast) but it is at least 1TB=1024GB and should let you fit in all your photos, videos and regular files and if you want the lightning speed, just swap the hybrid drive with an SSD of 128GB size or more as they are coming down in price. Intel HD 5500 is not ideal for heavy gaming of the latest 2014/2015 games at higher settings as it is an integrated card but is more than adequate for light to mid-range gaming and editing photos and videos. Screen is not touch enabled if you’d like one but the touchpad works fine and the keyboard feels comfy- I personally don’t use touch function much when I have it in front of me. This is not a gaming machine but you can play World of Warcraft, Minecraft, Sims 4 and other older titles at higher settings and frame rates per second without problems. Otherwise there is not much wrong with this machine, whichever model- i7 or i5 you choose and you’re getting all that it offers at quite an affordable price too, so it is well worth checking out.